Which is the Best Bird Bath for You and Your Backyard Birds? 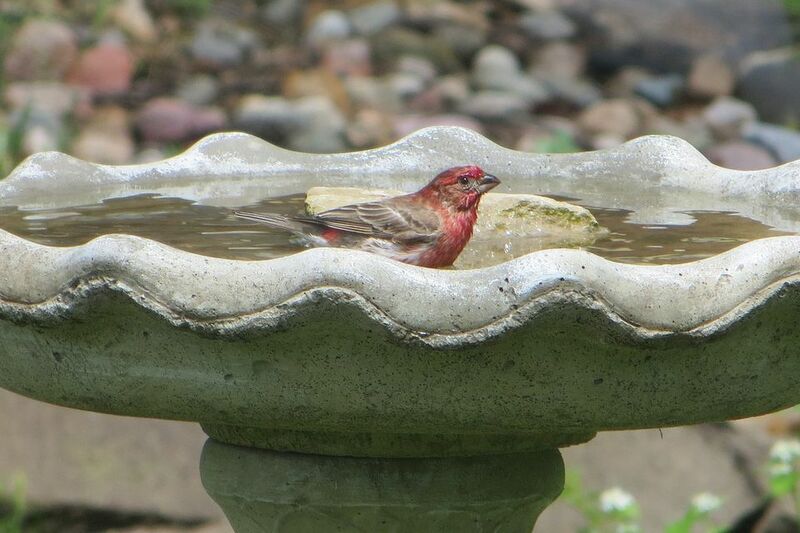 There are many types of bird baths to choose from, and both birders and gardeners should carefully consider many factors about design, construction, and convenience before they choose a bird bath. By making a careful choice, the bird bath you select is more likely to attract a wide range of beautiful bird species to your yard. Size: Small bird baths are easy and convenient, but a larger model can accommodate a greater number of birds without causing territorial conflicts. At the same time, a larger bath can be more challenging to move or clean, though the fact that it will hold more water can also be a benefit, whereas smaller baths may dry out more quickly. Appearance: If you choose a bird bath design you don’t like, you will be less inclined to keep it clean and filled. Choose a bath that fits well with your garden décor, personality, and style preferences to ensure that you can enjoy it even without birds. Landscape Proportions: Choose a bird bath that not only visually matches your garden, but one that is a suitable proportional size as well. A very large, ornate bird bath fountain may seem pretentious and out of place in a tiny yard, while a very small, simple design can be lost in a lush, elaborate garden. Bird Comfort: The best bird baths are designed with birds in mind. A narrow lip is a more comfortable perch for small birds, and the material of the bath should offer some texture for tiny talons to grip. An ideal basin will be 1-2 inches deep, and some models include both shallow and deep areas of the basin to accommodate birds of different sizes. Water Movement: Moving water will attract more birds than stagnant water in a simple basin. A bird bath that includes a dripper, mister, water spray, bubbler, or fountain is a better choice to attract a wide range of bird species. Furthermore, moving water will minimize insects and algae growth, which will keep the bath cleaner with less maintenance. Height: The height of the bird bath is critical for which birds will readily drink from it. Smaller birds are comfortable at taller baths that give them a better field of view, while larger birds such as doves, quail, and ducks prefer to drink from ground level basins. Cleanliness: Elaborate bird bath designs with detailed sculptures or delicate mosaics can be more challenging to keep clean and free from damage. Simpler styles, such as concrete bird baths or basic plastic basins, may be the best choice for ease of cleaning and overall durability. Some materials, such as glazed basins or copper bird baths, may stay naturally cleaner. Design: Whether you choose a hanging bird bath, pedestal model, or other basic design should depend on where you plan to put the bath. A hanging model is not the best choice if you don’t have a safe place to hang it from, and a broad pedestal bird bath isn’t a good option for a yard with no suitable level areas. Climate: The best bath for your yard is one you can use year round to provide a liquid water source for the birds. If you live in northern regions with long winters, a sturdy heated bird bath is the best choice. If you live in warmer areas, however, you may be more interested in a bird bath with a larger capacity that will not evaporate in just a few hours. Cost: A birder’s budget can be meager or extravagant, but the most important thing to remember about a bird bath’s cost is that birds don’t read price tags. Choose the best bird bath model you can within your budget and the birds will be happy to drink from it or take a quick, refreshing dip. You could even make a DIY bird bath on a very limited budget and still have an attractive, effective water feature for the birds. There may not be any one bird bath perfect for your yard or garden. Many birders have several baths of different sizes, styles, and heights scattered throughout their yards to offer a greater range of drinking and bathing options for the birds and to eliminate crowding or competition at water sources. Some birders also rotate bird baths throughout the year, using heated models during the winter and solar bird baths during the summer in order to attract the most birds. Whatever bird baths you choose, if you have carefully considered the options with your budget, garden, style, and birds in mind, it will be a great choice to bring thirsty birds to your yard.